If you have wondered about the shape and structure of field boundaries, how they were formed, when they were laid out and by whom, and how this was influenced by the then owner of the land, the King, Church, Lord or State. Then come along to the Methodist Church on Wednesday 13th March and get to know about the intricate and often bizarre shape of our field boundaries. 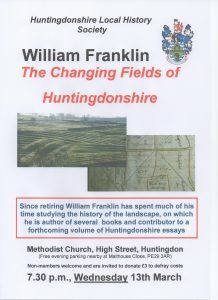 The speaker tonight is William Franklin, whose most recent book, “An Agricultural History of Ely” was given an award by the Cambridgeshire Association for Local History (CALH). 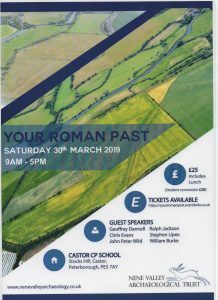 This is, however, only part of his broader investigation across the county into the development of fields from antiquity to the age of parliamentary inclosure. Tour includes coffee on arrival and lunch. Forge Mill Needle Museum in Redditch is an unusual and fascinating place to visit. This historic site illustrates the rich heritage of the needle and fishing tackle industries. Models and recreated scenes provide a vivid illustration of how needles were once made, and how Redditch once produced 90% of the world’s needles. On the same site, just a very short walk from Forge Mill Museum, are the ruins of Bordesley Abbey – a medieval Cistercian Abbey which has been extensively excavated. Bordesley Abbey Visitor Centre, which is set in an original reconstructed 16th century barn, tells the extraordinary story of the Abbey from its development in the 12th century to its destruction in 1538 by Henry VIII during the dissolution. Aston Hall is a magnificent seventeenth century red-brick mansion situated in a picturesque public park on the north side of Birmingham. Built between 1618 and 1635 for Sir Thomas Holte and home to James Watt Junior from 1817-1848, Aston Hall is steeped in history. Now a grade I listed building, the hall is restored to its former Jacobean splendour and is hugely popular with visitors of all ages. Walk through the stunning interiors and see the home that received royalty, was besieged during the English Civil War and inspired an author. The story of the Black Country is distinctive because of the scale, drama, intensity and multiplicity of the industrial might that was unleashed. It first emerged in the 1830s, creating the first industrial landscape anywhere in the world. Beneath the smoke and glare from blast furnaces and forges, Black Country innovation, entrepreneurial and manufacturing skill established the region’s supremacy for the making of wrought iron. The Black Country also possessed important hardware and other manufactures distinctive to itself – structural ironwork, chain making, locks and keys, tube manufacture, trap making and many others – which brought fame to Black Country towns across the globe. A Pioneering History. The house was built for John Nettlefold, a pioneer of early housing reform in Birmingham at a time when the city had a serious lack of decent homes for working people. John and his wife Margaret were from prestigious local families who had made their living in industry. Choosing their house to be designed in the Arts and Crafts style reflected their modern outlook. Winterbourne is a rare surviving example of an early 20th century suburban villa and garden. The house was built in 1903 for John and Margaret Nettlefold, of Guest, Keen & Nettlefold. Originally designed as a small country estate with rustic outbuildings and large gardens, Winterbourne followed the style of the Arts and Crafts movement with examples of local craftsmanship throughout the house. Margaret Nettlefold designed the garden, inspired by the books and garden designs of Gertrude Jekyll. 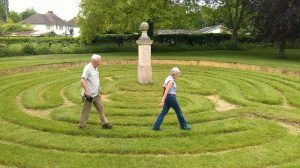 After a period of restoration, the garden was Grade II listed by English Heritage in 2008. There’s more than meets the eye at Croome. A secret wartime airbase, now a visitor centre, was once a hub of activity for thousands of people. Outside is the grandest of English landscapes, ‘Capability’ Brown’s masterful first commission, with commanding views over the Malverns. The parkland was nearly lost, but is now great for walks and adventures with a surprise around every corner. At the heart of the park lies Croome Court, once home to the Earls of Coventry with four floors to explore. The 6th Earl of Coventry was an 18th century trend-setter and today Croome follows his lead by using artists and craftspeople in the house to tell the story of its eclectic past in inventive ways, perfect for making new discoveries. Cream scones and tea will be served before we leave. This will be an interesting walk around the historic centre or Peterborough with our guide for the evening being Stuart Orme. Stuart is the Curator of the Cromwell Museum in Huntingdon but was the Curator of the Peterborough Museum for a number of years. 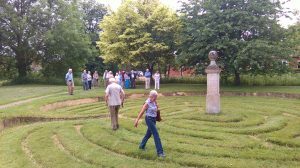 He has lived in Peterborough for a number of years and has conducted many guided walks around this medieval and modern city. RAF Wyton has a long and distinguished operational record from its beginnings during WW1 to the present day. The base is also the home of the Pathfinder Force Museum. This will be an afternoon visit to the RAF Wyton Museum and the Pathfinder Museum. This will be an afternoon visit to LIttle Gidding with the opportunity to visit this historic village and the Church. Cost will be about £5 per head which will include cake and tea/coffee. Further details of this trip and booking form will be issued shortly.